Posted on October 23, 2015 at 2:50 pm. I’m sharing this anecdote because it’s a good example of a common approach to addiction. A sobering fact delivered alongside a hefty slab of judgment and whoolah, the addicted person should be able to see the light and shed their habit. Aside from illustrating a rudimentary understanding of addiction, these types of stories also tend to use the language of us and them. If we don’t struggle with a nicotine addiction, we pat ourselves on the back. If we do, we feel a surge of self-loathing and step outside for a smoke to lift our mood…and because, well, FU. I’m not trying to skirt around the fact that smoking is detrimental to the health of the smoker, as well as to anyone exposed to secondhand smoke. We know that all forms of nicotine are harmful to health. I also support limits on the public spaces where people can smoke. And yes, of course I understand why a mother would express concern about the health of her son. But consider this anecdote again, and apply that flawed logic to another encounter with addiction, but this time make the addict a stranger. How many times have you heard someone, let’s say it’s your neighbor (for the sake of simplicity, let’s call him Ronald Rump) volunteer a running commentary on the homeless man who stands by Starbucks and jangles a bucket of change. Or that woman’s husband, who blah blah blah. Or that kid’s mom, who blah blah blah. Some of the cruelest jabs and gratuitous critiques are often directed at people entrenched in a world of pain, poverty, and addiction. And in my opinion, that’s far uglier than smoking. Shaming and scaring people into stopping a behavior, as you might imagine, generally doesn’t work. It’s barbaric. And mostly it acts as a trigger. Yet, somehow, it’s the common way we express our “concern.” Consider this excerpt from an article titled “Taking in All the Pain of What They Witness.” It was co-written by Gabor Maté, MD (author of In the Realm of Hungry Ghosts: Close Encounters with Addiction) and Danny Glover (yes, that Danny Glover, the actor, producer, and humanitarian). The chief reason we condemn drug users so vehemently may be simply that we do not wish to see our similarities to them. We want to perceive our own forms of self-soothing as somehow morally superior, or we just do not want to recognize how much our entire way of life resembles the frantic search for relief of the user. I define addiction as any behavior that, for the short term, we crave or find relief and pleasure in, but we are unable to give up despite the negative consequences incurred in the long term. By that standard, how many of us are not addicted? So, perhaps the 1.1 billion people who smoke cigarettes aren’t simply irrational, inconsiderate, or spineless. Perhaps this is not an issue of valuing a drug over family, or personal health. Perhaps the 24.6 million people (9.4% of the population) who live with substance dependence or abuse aren’t just a statistic of weak-willed people who just don’t care enough. What would happen if more of us considered these kinds of painful statistics from a place of compassion and reason, rather than from a place of judgement and fear? Perhaps we’re simply a planet full of humans who struggle due to real, identifiable reasons. Perhaps things would change for the better if we could talk about addiction from a place of compassion and connection rather than shame and fear. And perhaps we’d make even more progress if we identified and talked about the systemic issues that deeply influence our lived experiences. Unsurprisingly, I find that the most engaging information on this subject is coming from those experts in the field who are considered ‘radical.’ Dr. Gabor Maté is a staff physician at the Portland Hotel in Vancouver, a residence for people who struggle with mental illness and severe drug addiction (Maté also works in harm reduction clinics in Vancouver’s Downtown Eastside). In his book, In the Realm of Hungry Ghosts: Close Encounters With Addiction, Maté tells the stories of his patients – who represent one extreme of the spectrum of addiction, often heavy needle users – and who share one thing in common: childhood abuse. Coming from a theoretical framework that acknowledges the biological and socioeconomic roots of addiction, Mate argues that “early adversity” (stress, mistreatment, and particularly childhood abuse) increases susceptibility to addiction. In other words, those born into more disadvantaged circumstances have a higher risk of becoming addicts. My years in the community acupuncture clinic support Maté ‘s theories wholeheartedly: The violence of our social and economic systems are inscribed on people’s bodies, minds, and spirits. And those that require the most care are too often those that go without. Then there is Carl Hart, associate professor of psychology and psychiatry at Columbia University, and first tenured African American professor of sciences at Columbia University. Hart is known for his research in drug abuse and drug addiction. His book, High Price: A Neuroscientist’s Journey of Self-Discovery That Challenges Everything You Know About Drugs and Society challenges the myths surrounding drug abuse and addiction. Hart was initially inspired by the results of research on addiction done in the late 70’s. (For a beautifully illustrated and engaging explanation of this experiment, see this link.) In short, the research of Rat Park showed that rats in an “enriched cage” (which means that available to the rat were mates, exercise, and play) self-administer morphine at far lower rates than rats kept in solitary and desolate cages. In other words, if the rat was in an environment that provided healthy options of engagement, that environment became far more important than the drug itself – meaning that the rats used far less of the drug. In other words, they were far less likely to become addicted. This research prompted Hart to dig more deeply into the research of addiction. Lives and relationships are often destroyed by addiction, especially when addicts refuse to enter drug rehab, and Hart wanted to investigate this situation further. His conclusion? Addiction may not be the inevitable consequence of drug use, but rather an attractive distraction for those without preferable alternatives. In other words, for someone growing up in poverty, with little access to support and little to lose, the lack of access to healthy options could provide the external conditions for addiction to take hold. Hart unravels the common perception that drugs and drug addiction are the cause of many of society’s problems. While he doesn’t argue that illegal drugs have no negative effects, he takes the reader through his journey of discovery: that the pharmacology of the drugs themselves is not the cause of our social ills – rather, drugs are the symptoms of a broken society, masking the underlying issues of unemployment, lack of education, poverty, racism, and despair. He argues that anti-drug policies are causing more harm than the drugs themselves, and are directly marginalising black people, poor communities and other minority groups. He has seen this first hand, growing up, and his experiences are backed up by staggering statistics – that black people are up to five times more likely to be arrested than white people on drugs charges, and over 10 times more likely to be sent to prison for drugs offences, despite the fact that white and black people use drugs at similar rates. I’ve already written about the community acupuncture model a bunch, and out of risk of being annoying, let me just say this: community acupuncture clinics provide accessible, affordable healthcare for all – and we can help. This is an example of a non-medicinal approach to combating addiction that is seeing results. For more alternative addiction recovery solutions, visit alternativetomeds.com. To sum up this post, I’ll leave you with a quote from Lisa Rohleder, co-founder of Working Class Acupuncture, People’s Organization of Community Acupuncture (POCA), and POCA Tech. This quote is from her keynote speech at the most recent gathering of community acupuncturists affiliated with POCA. Paolo Freire (more about him in a minute) says that it is everyone’s vocation to become more fully human. Injustice, exploitation, and oppression make us less human — whether we are in the role of oppressors or of oppressed. And we know that in this society most of us, often, are both. We have so many opportunities, here in late capitalism, to treat each other and ourselves as if we weren’t actually human beings. But for the most part, community acupuncture clinics are the opposite. They’re set up so that we meet each other primarily as human beings rather than as numbers or roles or images or income streams. We recognize that everyone suffers, everyone has needs, everyone is struggling with limited resources. And so for the most part, at least on our good days, our POCA clinics are humanizing environments. Which means they are also, potentially, radicalizing environments. Once you start GENUINELY believing in and valuing the human dignity of people who don’t have a lot of money, people with whom you would not otherwise be having relationships, people of different ages and genders and ethnicities and races and backgrounds, people with whom you share, despite those differences, an awareness of suffering — at that point, my friend, the work you’re doing as a volunteer or a receptionist or an acupuncturist, at that point your work has dangerous potential. Because liberation is a process. Once it starts, it doesn’t want to stop. Once you start treating all kinds of different people as human beings, it gets harder to stop, it gets harder to turn it off when society tells you to. You’ve put yourself in a situation where you can’t quite look past people who are supposed to be invisible. When you’re in the grocery store, you notice that the checker is wearing wrist braces and you realize she’s in pain. You think about her working conditions, about whether she has to stand all day and besides her wrists, how’s her low back? You get to the point where you can’t look at another person without wondering, what hurts? If more people wondered that, if they acted on it, capitalism might not function. What would happen if we insisted on treating people like people, and stopped treating people like things? If you’re in Maine and trying to find affordable or free services to get well, please see here and here. Posted on October 15, 2015 at 3:26 pm. 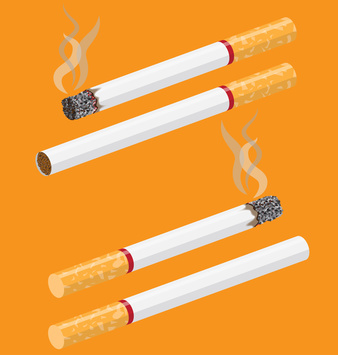 Acupuncture as an approach to smoking cessation has continuously growing support. In some states, acupuncture is a court-mandated treatment for addicts due to the recognized benefits of how acupuncture can help alleviate withdrawal symptoms and curb cravings. Of course, acupuncture is not a magic bullet in the treatment of addiction, but if you’re motivated to stop a habit, acupuncture can make it easier to quit. But if you have tried a number of methods like nicotine patches and nicotine gum and they have not been effective, maybe this is the solution for you. But if you haven’t and the first solution that came to mind was Acupuncture, maybe it is worth trying other methods of quitting. For someone who has recently made this decision, this method should be your last resort. Of course just because something works for someone else doesn’t mean it will have the same effect, but you never know if you don’t try. Why not check out sites like https://www.gourmeteliquid.co.uk, where you may be able to find an easier way of quitting. It is definitely worth a try, especially if leading a healthier lifestyle is your main goal. When it comes to Acupuncture, treatments focus on everything from withdrawal symptoms (jitters, irritability, unpredictable emotions, insomnia, fatigue, and restlessness) to helping you stay grounded through triggering events or periods of high stress. What Acupuncture Points Are Used? Most often, a combination of body points and ear points are used, though in some cases, it’s possible to bypass the personalized approach and use the “NADA protocol.” The NADA protocol consists of five points in the ear. 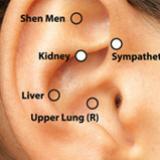 In the illustration below, from the National Acupuncture Detoxification Association UK, the white dots imply that these points are “under” or “deep” to the part of the ear that are shown in this picture. From the National Acupuncture Detoxification Association UK. Tian Mei: an extra-meridian point located on the wrist between LU-7 (Lieque) and LI-5 (Yangxi), a specific point to quit smoking. Four Gates: (Large Intestine 4 and Liver 3), used to circulate qi throughout the body and calm the nervous system. Typical treatments last about 30-40 minutes, with the patient being treated 1-3 times a week for the first month of smoking cessation. Most patients wean from such frequent treatments once they begin feeling more grounded and able to stay the course, and will come for “tuneups” when necessary. 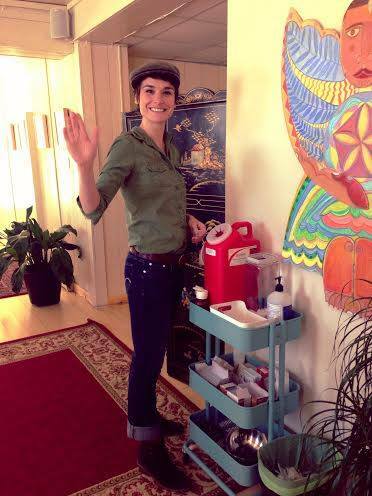 Real live acupuncturist who harbors, deep within her heart, the incorrigible belief that together we can recover, heal, and find more moments of peace in our lives. So let me poke you! The NADA protocol was initially used to aid relaxation and well-being for people suffering with substance misuse problems, and/or in recovery. I use it for these purposes every day in the community clinic. Practitioners of all stripes understand that pain, stress, anxiety, and depression are some of the most common and costly complaints in the world of medicine. One of the reasons the NADA protocol has received global recognition as an effective treatment for these costly complaints is due to this simple fact: The NADA protocal has calming effect on the central nervous system. From a physiological perspective, consider that one major effect of the stress response is elevated levels of glucocorticoids (like cortisol). The parts of the brain most susceptible to the stress response are the areas loaded with high-concentrations of glucocorticoid receptors; these very same regions are involved with common mood imbalances, like anxiety and depression. Acupuncture can help re-calibrate the primary central nervous system – in other words, for many it acts as a physical, mental, and spiritual “reset” button. Christian Nix, and acupuncturist and a tireless advocate of Hospital Based Acupuncture (his Community Pain and Stress Center is the first private model of community-style practice to be integrated into a major hospital system), often writes about acupuncture from a biomedical perspective. Much of this blog post has been inspired by his writings and his collection of research. If you’d like to see a list of the research that’s been done on acupuncture and the stress response, please see his excellent article in Acupuncture Today, which can be found here.